My great-great grandfather, Adj. William Beynon Phillips of the 2nd. Pa. Provisional Heavy Artillery was one of 6 officers of the regiment captured at the Battle of the Crater. The 2nd. Pa. Provisional “Heavies” were the first regiment to enter the Crater and emerge out of it as a unit. Prior to his capture he participated in the Union charge of June 17th. and the Siege of Petersburg. Following his capture he was imprisoned at Camp Asylum, Columbia , S.C. I have published 40 of his letters on my blog commemorating his service to his adopted country. Of particular interest is his letters of July 4, 1864 in which he describes the charge of June 17th. 1864 and June 20, 1864 in which he describes in very great detail a night artilley exchange. I invite you to read these great letters. My 2 x great-grandfather, Confederate Corporal David Land, Company I 13th NC. 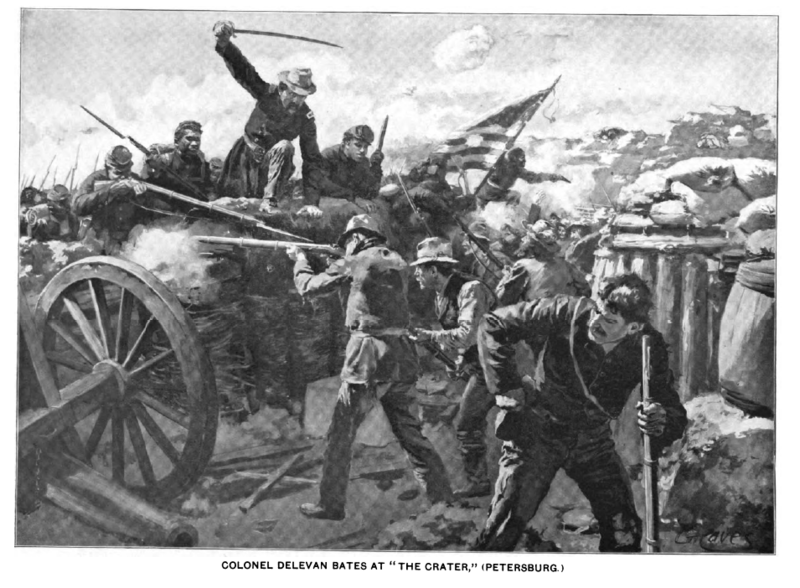 Infantry served in the Petersburg trenches until his capture April 2,1865. Also serving were two of his nephews, Private John Land Co.B 11th NC. Infantry and Private James Jefferson Land Company D 63rd TN. Infantry. John was mortally wounded on April 2nd and captured while hospitalized in Richmond on April 3rd. He died while still in Federal custody on July 9,1865. James was surrendered and paroled at Appomattox. He was one of 28 remaining of the 63rd TN. One of only 7 remaining of Company D.
I know of letters from Delaware soldiers at Petersburg, but they belong to the state of Delaware and I would have to get permission to use or share them. My GG Grandfather was Seth Gardner who fought with the 185th Infantry, Company C out of New York. He was from Onondaga County N.Y. He fought at the Battle of Five Forks and was present when Lee surrendered to Grant. Seeking a photograph of his Company and Or of him.